Earth scientist Zach Eilon plumbs the depths of the Pacific Ocean to learn more about plate tectonics. Voyaging across a vast swath of the Pacific Ocean to learn more about how the Earth’s tectonic plates work, scientist Zach​​ Eilon was assisted along the way by friendly deep-sea denizen SpongeBob SquarePants. No, the beloved animated character wasn’t really there, but SpongeBob was the nickname Eilon, a UC Santa Barbara assistant professor of earth sciences, gave the sophisticated instrument that played a key role in his research. Otherwise known as ocean bottom seismometers, or OBS’s, these instruments are sensitive enough to detect earthquakes on the other side of the world. While the seismometers themselves sit on the seafloor, they are attached to a bright yellow flotation package — hence, the SpongeBob comparison — and are about a meter in width. The packages are affixed to a plastic base containing complex electronics. Eilon and collaborators carefully placed 30 of them on the ocean floor about 2,000 miles southeast of Hawaii during their recent Pacific ORCA (Pacific OBS Research into Convecting Asthenosphere) expedition aboard the U.S. Navy research vessel Kilo Moana. 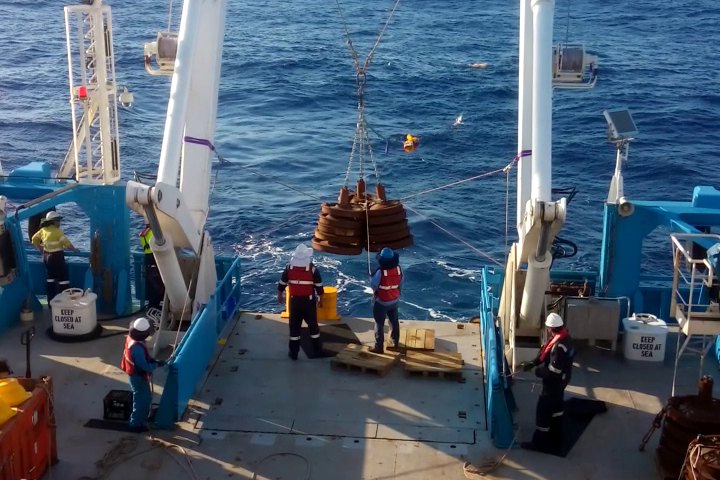 The trip and the experiment were part of an ongoing and high-profile international effort, on which UCSB is one of three lead institutions in the U.S., to seismically instrument the Pacific Ocean. Oceanic plates make up 70 percent of the Earth’s surface and offer important windows into the Earth’s mantle, Eilon said, yet they are largely unexplored due to the obvious challenge of putting sensitive electronics three miles beneath the sea surface. 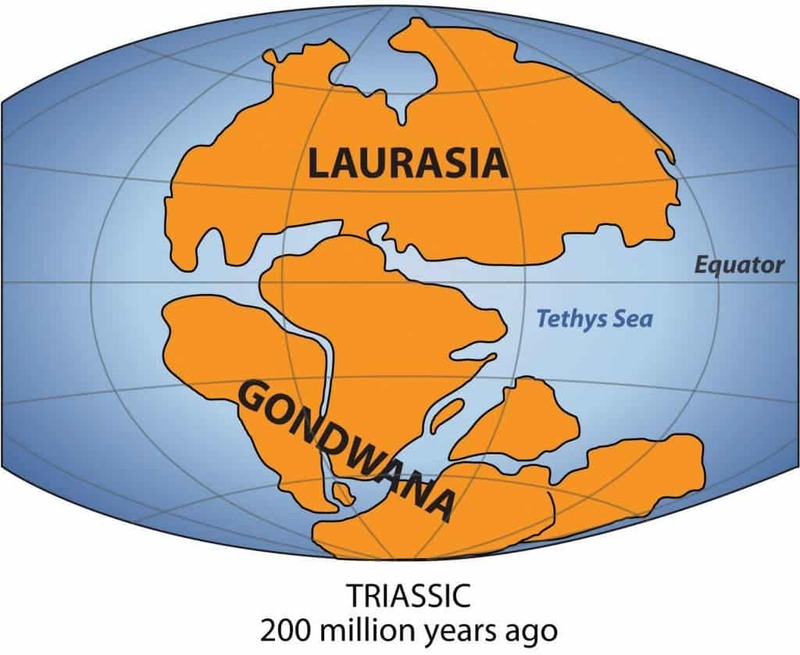 The earth science community has identified several unanswered questions regarding the thermal structure of oceanic plates, the significance of volcanism in the middle of oceanic plates and how the convecting mantle beneath the plates controls their movements. Undulations in the gravity field and unexplained shallowing of the ocean floors hint that small-scale convection may be occurring beneath the oceanic plates, but this remains unconfirmed, according to Eilon. The new experiment could help prove it. 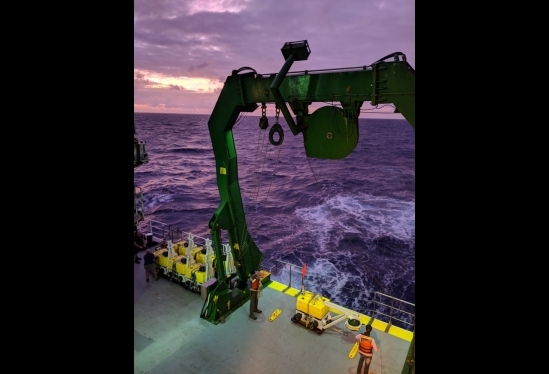 When they are recovered in July 2019, the OBS units are expected to provide data that allows Eilon and his collaborators to make 3-D images of the oceanic tectonic plates – a bit like taking a CAT-scan of the Earth. Of particular interest is the mysterious asthenosphere, the zone of Earth’s mantle lying beneath the lithosphere (the tectonic plate) and believed to be much hotter and more fluid than rocks closer to the surface. The asthenosphere extends from about 60 miles to about 250 miles below Earth’s surface. Once ready for deployment, the weighted instrument packages are designed to carefully sink upright to the seafloor. When the science party returns to the site, the ship will send an acoustic signal down to the individual science packages, commanding them to release the weight holding them down, allowing the buoyant yellow “SpongeBob” portion of the device to slowly float them to the surface, he explained. Once on the surface, the ship’s crew will home in on the package (which has a light, flag, and radio so the scientists can locate it) and lift it from the sea. From there the science team will commence the process of downloading the seismic data which are detailed records of the ocean floor vibrations. Turning these wiggles into 3D images is the result of highly complex computer processing and mathematics. Eilon said that in addition to giving researchers a better idea of how the Earth’s tectonic plates work, the data is expected to provide important information about geologic hazards. 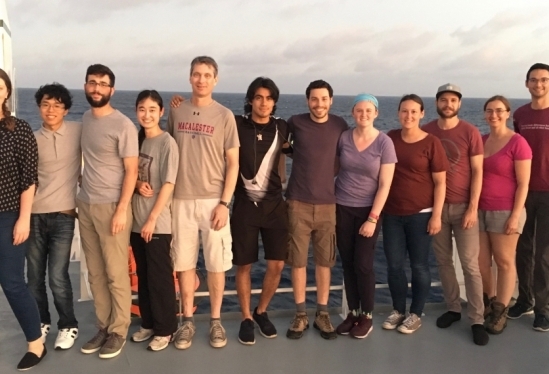 Eilon, along with co-principal investigator Jim Gaherty of Columbia University, led the expedition’s diverse 14-member science team (drawn from 11 institutions across three continents). The $4-million research project is supported by the National Science Foundation. 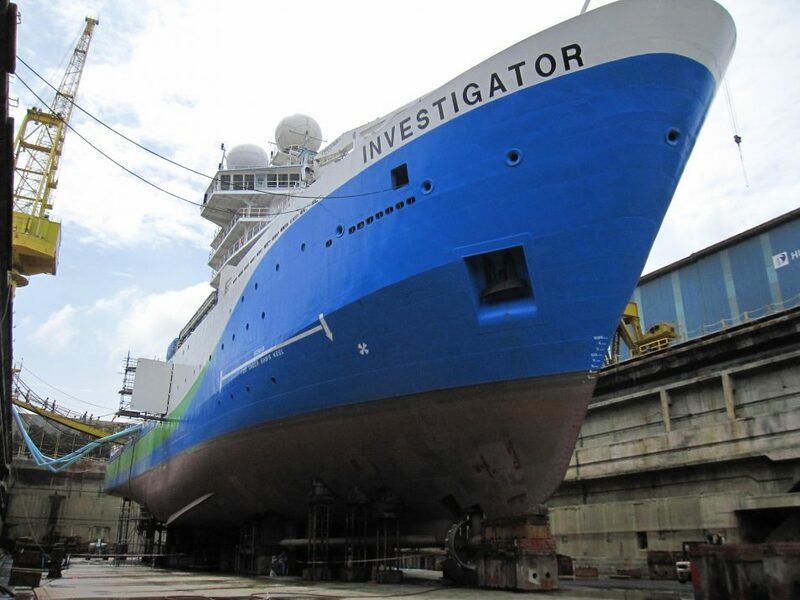 Investigator in dry dock in Singapore. Image Mike Watson. The ship is our research vessel Investigator. Newly built, it sits in dry dock at Sembawang Shipyard in Singapore. Freshly painted in blue, green and white, Investigator waits patiently for water to flood the dock to lift it from its supports and float free for the first time. 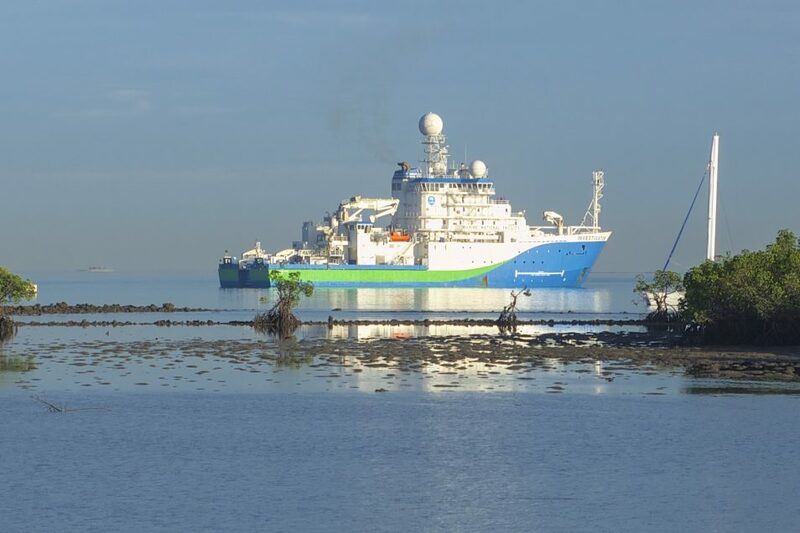 The ship is a game-changer for marine research in Australia. With capabilities far beyond those of previous Australian research vessels, Investigator will voyage far and do big science. It gives the nation a world-leading scientific edge to help answer big questions about the marine environment and resources, climate and food security. Installation complete, the ship log is switched on for the first time. The display flickers into life and shows 0 nautical miles (NM). Our journey begins. Investigator arrives in its home port of Hobart, Tasmania. Science takes you places. Investigator has travelled from Singapore to Hobart, and is undergoing sea trials ahead of commissioning. The trials test the limit of the ship’s endurance, taking it past 60°S to the edge of the Antarctic sea ice. 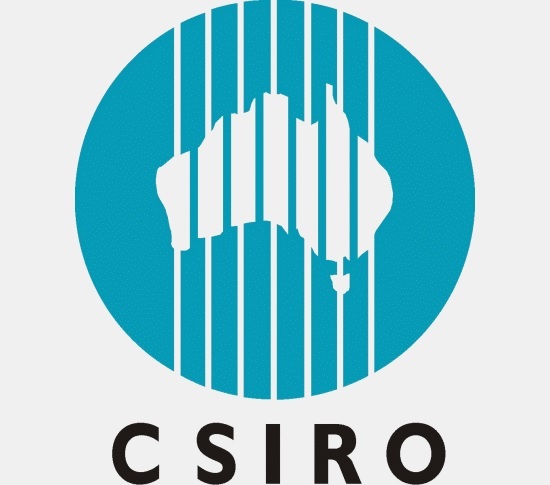 On return, and nearly three years after construction began, Investigator is commissioned at the CSIRO Marine Laboratories in Hobart on 12 December 2014. 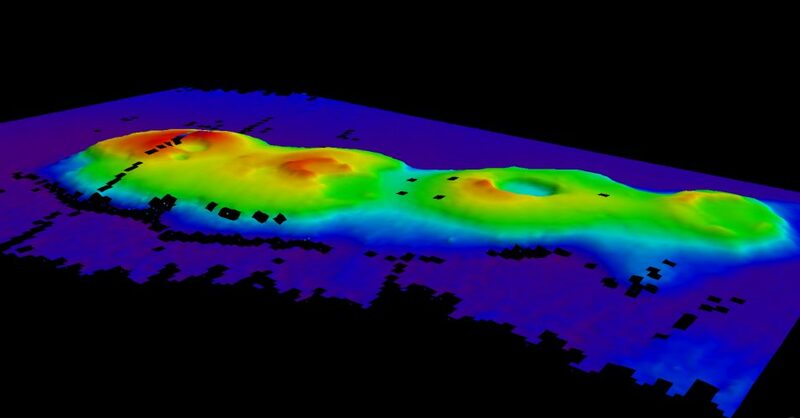 Discovering undersea volcanoes off the NSW coast. 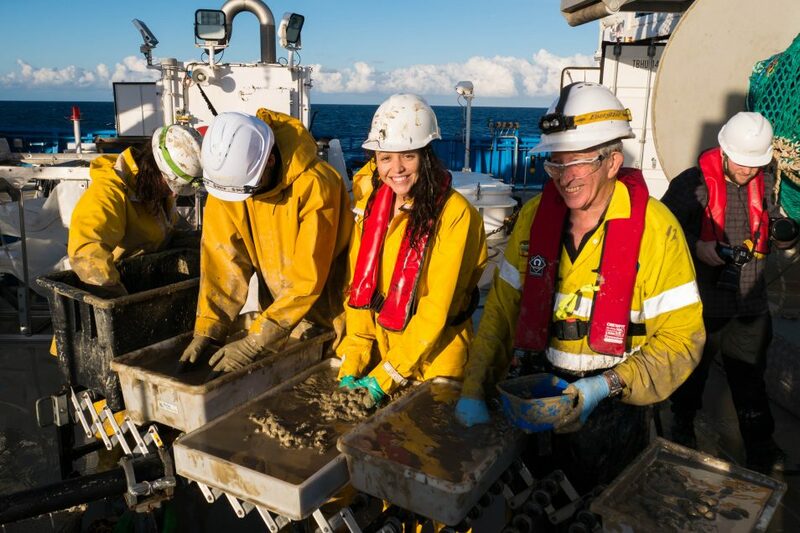 While on a voyage to study the East Australian Current, seafloor surveys pick up some unusual features off the coast of Sydney. They look like a row of egg cups. The egg cups are ancient marine volcanoes, never seen before, but now appearing in bright colour on monitors across the ship. Scientists watch the story unfold in the evening news as they continue their work on board. This ship runs on a 24/7 mix of high-octane science. Investigator approaches the remote Heard Island. Image Pete Harmsen. Investigator has journeyed to a remote corner of our vast ocean estate to study volcanoes on the sea floor. While at Heard Island, steam rising from Big Ben signals to those on board that they have arrived in time to witness a rare eruption from one of Australia’s only active volcanoes. Big Ben expresses himself, giving researchers a bang for their investigatory buck. Image: Pete Harmsen. Collaboration leads to some deep discussions about data. Image Gloria Salgado Gispert. 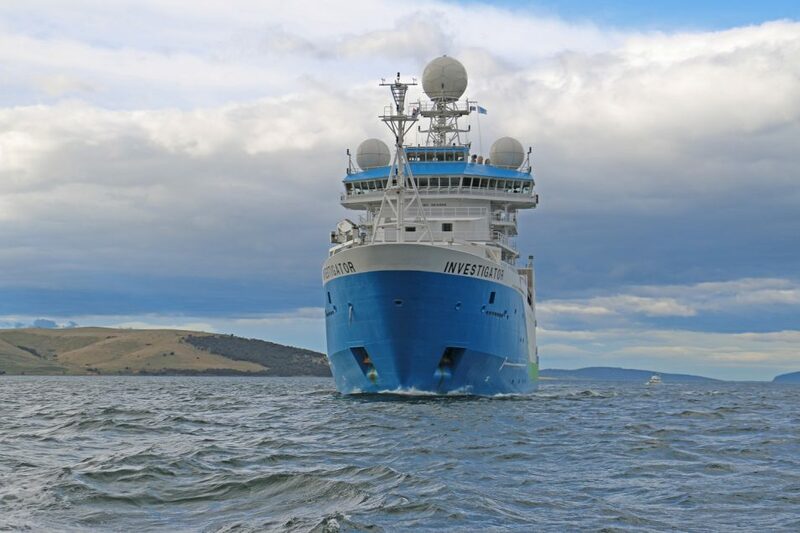 Investigator’s great capacity for work has allowed three separate projects to be combined on this voyage to study the Southern Ocean, from the deep ocean high into the atmosphere above. The mixing pot of scientists, gathered on board from both near and far, leads to the sharing of ideas and knowledge from researchers across multiple disciplines. Importantly, it also gives students on board the chance to learn from world-renown experts in marine and climate science. Investigator in tropical waters off Lautoka, Fiji. We have better maps of the moon than we do of our sea floor. The advanced mapping technology on Investigator is slowly chipping away at the edges of the unknown on each and every voyage. 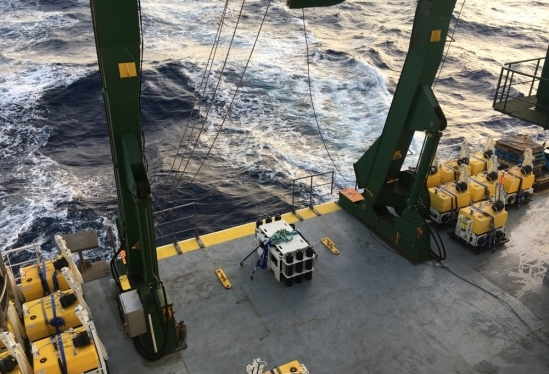 A transit voyage back from Fiji provides scientists with the opportunity to collect seafloor samples and map previously unseen underwater landscapes formed during the break-up of Gondwana. A deep-water mooring anchor stack is deployed from the back deck. Anchors away! Another mooring is lowered into the ocean. These form part of an important network of monitoring stations in oceans across the planet which feed data into global datasets. This is data that allow us to better understand ocean and climate change. Before Investigator, these deployments took smaller ships many voyages back and forth. Now, the ship is loaded up and heads out to complete the job in one go. Investigator gets up close to the ice edge in Antarctica. It takes a lot of patience to study glaciers, especially those at the ends of the Earth! It’s a long way down and a long way back. Luckily, they aren’t going anywhere fast. Or are they? The science we’re enabling on this voyage will help us find out. Since arriving, Investigator has now completed 15 research and transit voyages totalling over 400 days of science at sea. Scientists look for signs of life in sediments from the abyss. Image Asher Flatt. Marine life can be found in some hard to reach places. Investigator is on a voyage to study life in Australia’s deep ocean abyss off the east coast. Seven Commonwealth Marine Reserves are being mapped and studied. Many of the denizens of the deep discovered are soon to become worldwide science sensations. Investigator enables unique studies of the biodiversity in our oceans. In the warm waters off the coast of Western Australia, Investigator is studying the long term recovery of trawled marine communities. It is part of a circumnavigation of the continent completed during 2017 that saw the ship conduct research in all offshore waters. It’s our first big lap but it won’t be our last. Clocking up the big science miles! 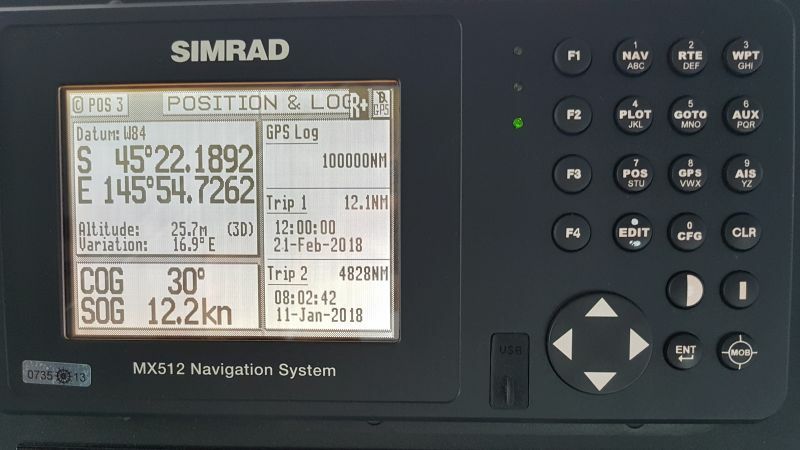 Deep in the Southern Ocean, returning from its first voyage for 2018, Investigator passes a significant milestone on the ship log. That’s about 4.5 laps of the globe (at the equator). 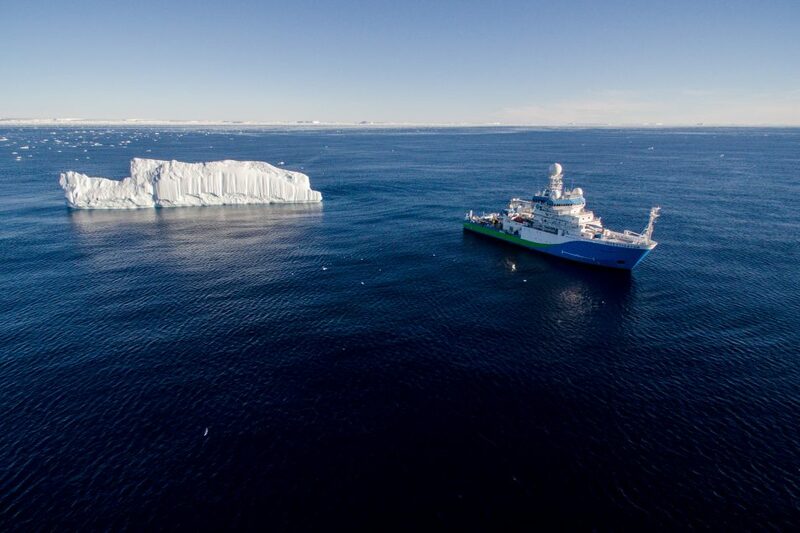 Across the journey, over 800 scientists, researchers and support staff (including over 100 students) from Australia and over 15 other countries have stepped on board as part of voyage science teams. For the 40 members of the science team on board today, it’s business as usual. The science doesn’t stop to celebrate. This is what the ship does. Big science over the big journey to answer the big questions. The journey is only just beginning for this ship. It’s still a somewhat precocious teenager. With an operational life stretching out at least 25 years, much more science lies ahead for RV Investigator and our future heroes of science on board. After years of work from hundreds of students, the Duke Ocean XPRIZE team has qualified for the final round of competition aimed at autonomously mapping the ocean floor. Duke Engineering students stand with their prototype heavy-lifting drone after a test flight for the Ocean Discovery XPRIZE competition. No image credit. Building on the research of more than two years of students in an innovative engineering course, a Duke University team is among the final nine teams left standing in the $7 million Shell Ocean Discovery XPRIZE that will conclude this fall. The Shell Ocean Discovery XPRIZE presents teams with the ambitious goal of mapping 250 square kilometers of ocean up to 4,000 meters deep within a half-meter resolution in less than 24 hours. The competition also requires teams to identify and image 10 archeological, biological or geological features. To make the task even harder, no boats or humans are allowed—the surveying must be completed with a system of autonomous drones that can all fit within a standard shipping container. The XPRIZE contests have a reputation for being challenging and audacious. The Google Lunar XPRIZE competition to send a robot to the moon ended this year without a winner. But the original Ansari XPRIZE to launch people into space with a reusable spacecraft found a winner, and the Wendy Schmidt Ocean Health XPRIZE aimed at developing ocean pH sensors found three. Whether teams are able to complete the challenge or not, the lofty goals of the XPRIZE competitions serve to push science forward, catalyze new markets and provide incentives for talented, intelligent people to innovate and make significant impacts. More than 30 teams submitted proposals at the start of the competition, and 19 were chosen as semi-finalists based on their technical merits in early 2017. These teams included more than 350 people from 25 countries, ranging from undergraduate students to industry professionals. The Duke team is joined in the finals by just one other university-based team, from Texas A&M. Both student teams will be competing against teams formed by industry professionals in Germany, Switzerland, Japan, Portugal, England and the United States. The Blue Devil Ocean Engineering team has taken an unusual tactic—several undergraduate classes were formed at the start of the competition to begin work on the project. While a handful of graduate students and undergraduate students working through independent studies have been able to stick with the project since its inception, most of the work being done each year is by an entirely new set of students. This means that few of the students finishing the competition this fall will have been the ones who started it in 2016. “Each year there’s a bit of a slowdown as the new students come up to speed on the project. But at the same time, they come in with fresh ideas and a lot of energy,” said Doug Nowacek, the Randolph K. Repass and Sally-Christine Rodgers University Associate Professor of Conservation Technology in Duke’s Nicholas School of the Environment and Pratt School of Engineering. A computer-generated rendering of the initial prototype for the heavy-lifting drone designed to compete in the Ocean Discovery XPRIZE. Duke’s approach is to use giant heavy-lifting drones to deploy and retrieve a series of sonar-equipped sensors that are lowered from floating platforms at the ocean’s surface. This is much more difficult than it sounds. The drones must autonomously navigate gusting winds and waves that average six meters in height while dropping off and retrieving the sensors. The floating sensor platforms must carry at least 3,500 meters of cable to lower and then pull up the sensor pods, making them extremely heavy for the drones to carry. The sensor pods themselves must withstand the pressure, temperature and salinity of the ocean’s depths. And to successfully map the area required, the team must deploy multiple drones making multiple drop-offs and pick-ups, and then seamlessly analyze all of the data. To advance to the final round, the semifinalist teams had to pass a Round 1 Technology Readiness Test, which comprised site visits to each team by XPRIZE staff and judges. The teams were tested against 11 measurement criteria to show their technological solutions were capable of meeting the operational requirements necessary for rapid, unmanned and high-resolution ocean mapping and discovery. When the judges visited Duke, they saw a team with all of its components in place. The team has built and flown a heavy-lift drone in Duke Forest. They have sensor pods that have been tested at the Duke University Marine Laboratory in Beaufort, North Carolina. They have software to analyze the resulting data. The combination was enough to move them into the final round of competition. As the school year draws to a close, more than 50 students are now working to finalize their design. More rotors are being added to the drone to make sure it can lift the heavy sensor pods. Control software is being smoothed so that the drone can pick up the pods while using as little energy as possible. And the sensor pods themselves are receiving upgrades to increase their range so that fewer drops are needed to cover the area required in the final stage of competition. Students test a prototype floating launching pad for their sonar pods. No image credit. “Our goal is to get this project to the point where all the next group of students need to do is build more of the drones and sensors that we’ve already completed,” said William Willis, a junior studying mechanical engineering who plans to continue participating during his senior year. “We want to demonstrate a full cycle of dropping off a sensor, mapping an area and picking it up before graduation in May,” added Nick Lockett, a senior studying electrical engineering. The team hopes to get some help assembling more units over the summer from high school students brought in by Tyler Bletsch, assistant professor of the practice of electrical and computer engineering at Duke, who has also been instrumental to the project. Whether or not they are successful in either their short-term goals or the final competition, the massive, long-term project has been valuable for everyone involved. The nine finalist teams will be formally recognized and awarded at Oceanology International’s Catch the Next Wave conference in London on March 15. Attending the event for the Duke University team will be Brooke and graduating senior Sam Kelly—one of the few undergraduate students who has worked on the project since its inception. The final Round 2 testing will take place during October and November of 2018. Each summer, the international research laboratory CERN, home to the Large Hadron Collider, welcomes dozens of students to work alongside seasoned scientists on cutting-edge particle physics research. Many of these students will pursue physics research in graduate school, but some find themselves applying the lessons they learned at CERN to new domains. In 2011, MIT undergraduate Grace Young was one of these CERN summer students. 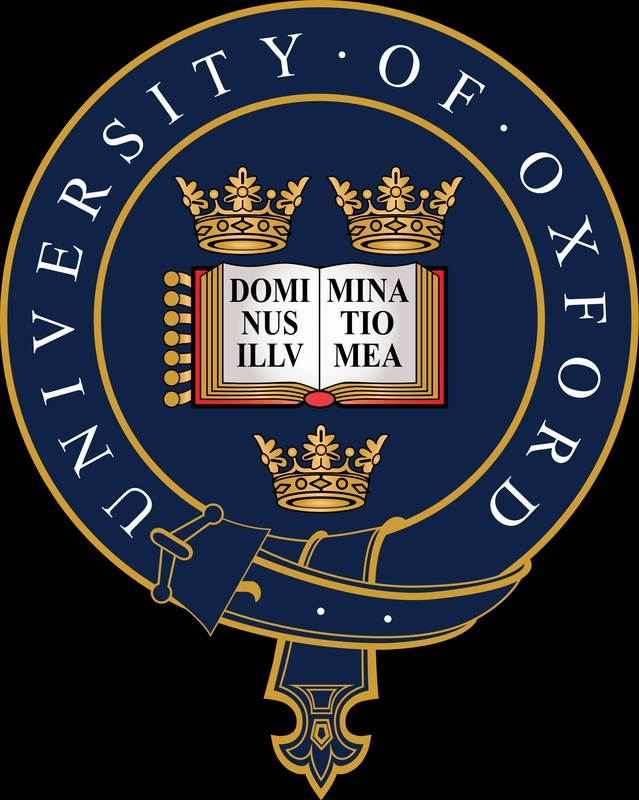 Today, Young is completing her PhD in ocean engineering at the University of Oxford and is chief scientist for the deep-sea submarine Pisces VI. She develops technology for ocean research and in 2014 lived underwater for 15 days. During a recent visit to CERN, Young spoke with Symmetry writer Sarah Charley about the journey that led her from fundamental physics back to her first love, the ocean. As a junior in high school you competed in Intel’s International Science Fair and won a trip to CERN. What was your project? A classmate and I worked in a quantum physics lab at University of Maryland. We designed and built several devices, called particle traps, that had potential applications for quantum computing. We soldered wires onto the mirror inside a flashlight to create a bowl-shaped electric field and then applied alternating current to repeatedly flip the field, which made tiny charged particles hover in mid-air. We were really jumping into the deep end on quantum physics; it was kind of amazing that it worked! Winning a trip to CERN was a dream come true. It was a transformative experience that had a huge impact on my career path. You then came back to CERN as a freshman at MIT. 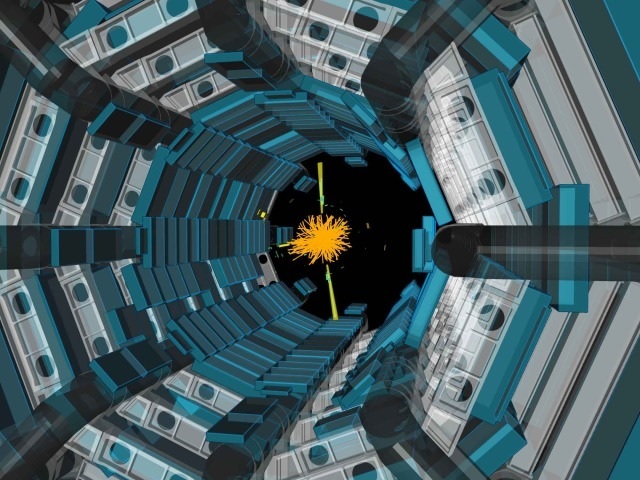 What is it about CERN and particle physics that made you want to return? My peek inside CERN the previous year sparked an interest that drove me to apply for the CERN openlab internship [a technology development collaboration between CERN scientists and members of companies or research institutes]. Although I learned a lot from my assignment, my interest and affinity for CERN derives from the community of researchers from diverse backgrounds and disciplines from all over the world. It was CERN’s high-powered global community of scientists congregated in one beautiful place to solve big problems that was a magnet for me. You say you’ve always loved the ocean. What is it about the ocean that inspires you? ’ve loved being by the water since I was born. I find it very humbling, standing on the shore and having the waves breaking at my feet. This huge body of water differentiates our planet from other rocks in space, yet so little is known about it. The more time I spent on or in the water, either sailing or diving, the more I began taking a deeper interest in marine life and the essential role the ocean plays in sustaining life as we know it on Earth. What does an ocean engineer actually do? One big reason that we’ve only explored 5 percent of the ocean is because the deep sea is so forbidding for humans. We simply don’t have the biology to see or communicate underwater, much less exist for more than a few minutes just below surface. But all this is changing with better underwater imaging, sensors and robotic technologies. As an ocean engineer, I design and build things such as robotic submersibles, which can monitor the health of fisheries in marine sanctuaries, track endangered species and create 3-D maps of underwater ice shelves. These tools, combined with data collected during field research, enable me and my colleagues to explore the ocean and monitor the human impact on its fragile ecosystems. I also design new eco-seawalls and artificial coral reefs to protect coastlines from rising sea levels and storm surges while reviving essential marine ecosystems. What questions are you hoping to answer during your career as an ocean engineer and researcher? 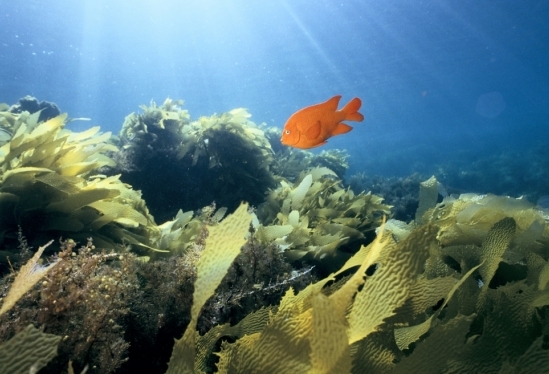 How does the ocean support so much biodiversity? More than 70 percent of our planet is covered by water, producing more than half the oxygen we breathe, storing more carbon dioxide than all terrestrial plant life and feeding billions of humans. And yet 95 percent of our ocean remains unexplored and essentially unknown. The problem we are facing today is that we are destroying so many of the ocean’s ecosystems before we even know they exist. We can learn a lot about how to stay alive and thrive by studying the oceanic habitats, leading to unforeseeable discoveries and scientific advancements. What are some of your big goals with this work? We face big existential ocean-related problems, and I’d like to help develop solutions for them. Overfishing, acidification, pollution and warming temperatures are destroying the ocean’s ecosystems and affecting humans by diminishing a vital food supply, shifting weather patterns and accelerating sea-level rise. Quite simply, if we don’t know or understand the problems, we can’t fix them. Have you found any unexpected overlaps between the research at CERN and the research on a submarine? Vision isn’t a good way to see the underwater world. The ocean is pitch black in most of its volume, and the creatures don’t rely on vision. They feel currents with their skin, use sound and can read the chemicals in the water to smell food. It would make sense for humans to use sensors that do that same thing. Physicists faced this same challenge and found other ways to characterize subatomic particles and the celestial bodies without relying on vision. Ocean sciences are moving in this same direction. 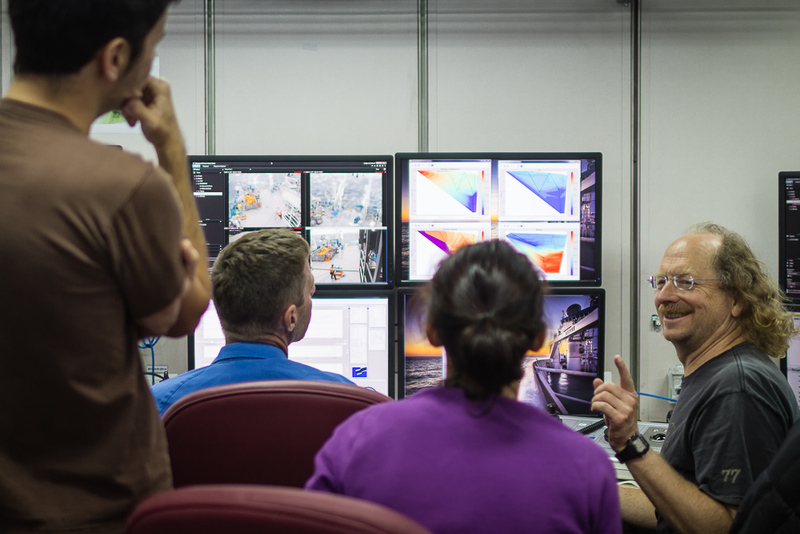 What do you think ocean researchers and particle physicists can learn from each other? I think we already know it: That is, we can only solve big problems by working together. I’m convinced that only by working together across disciplines, ethnicities and nationalities can we survive as a species. Of course, the physical sciences are integral to everything related to ocean engineering, but it’s really CERN’s problem-solving methodology that’s most inspiring and applicable. CERN was created to solve big problems by combining the best of human learning irrespective of nationality, ethnicity or discipline. Our Pisces VI deep sea submarine team is multidisciplinary, multinational and—just like CERN—it’s focused on exploring the unknown that’s essential to life as we know it. 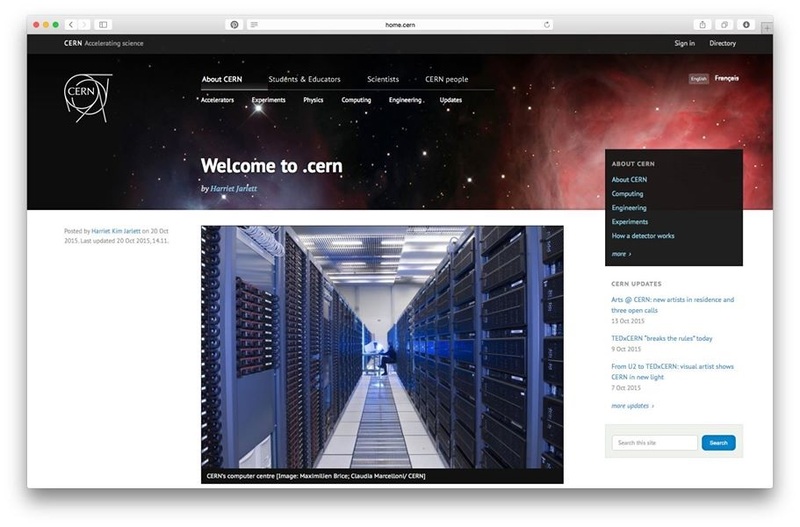 CERN openlab was created in 2001 (link is external) and is now in the phase V (2015-2017). This phase tackles ambitious challenges covering the most critical needs of IT infrastructures in domains such as data acquisition, computing platforms, data storage architectures, compute provisioning and management, networks and communication, and data analytics. Human interference in the deep sea could already be outpacing our basic understanding of how it functions, University scientists have warned. As a result, without increased research and an immediate review of deep ocean conservation measures, the creatures that live there face an uncertain future. Vibrant, mysterious and often referred to as the ‘final frontier’, the deep sea floor is the largest habitat on Earth. This vast area, which lies below 200m and accounts for 60% of the surface of the planet, is home to an array of creatures. However, very little is known about how it functions and, in particular, how populations of deep sea creatures are interconnected. 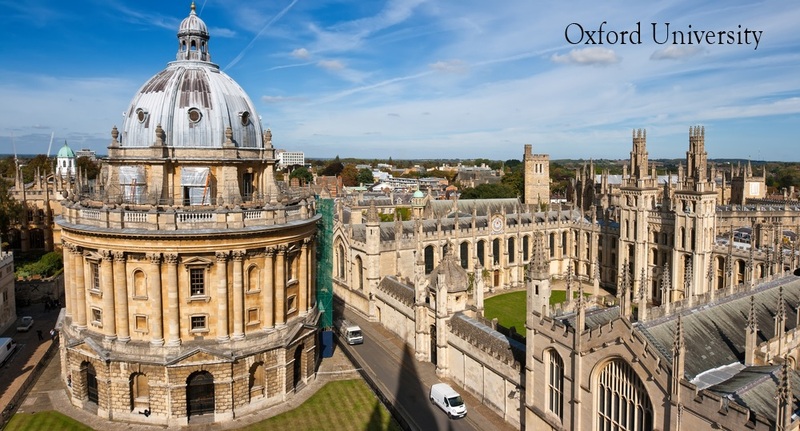 In a new review published in Molecular Ecology, scientists from the Department of Zoology at Oxford University have considered all knowledge published to date of deep sea invertebrates. The paper highlights the disparity between our basic knowledge of the ecology of deep sea animals and the growing impact of humans on the deep ocean. Over the last thirty years there have only been 77 population genetics studies published on invertebrate species, the type of animals that dominate these deep areas. Of these papers, the majority have focused on commercial species at the shallower end of the depth range of up to 1000m, and only one has been conducted on creatures that live deeper than 5000m. As a result, life in the depths of the ocean remains a relative mystery. 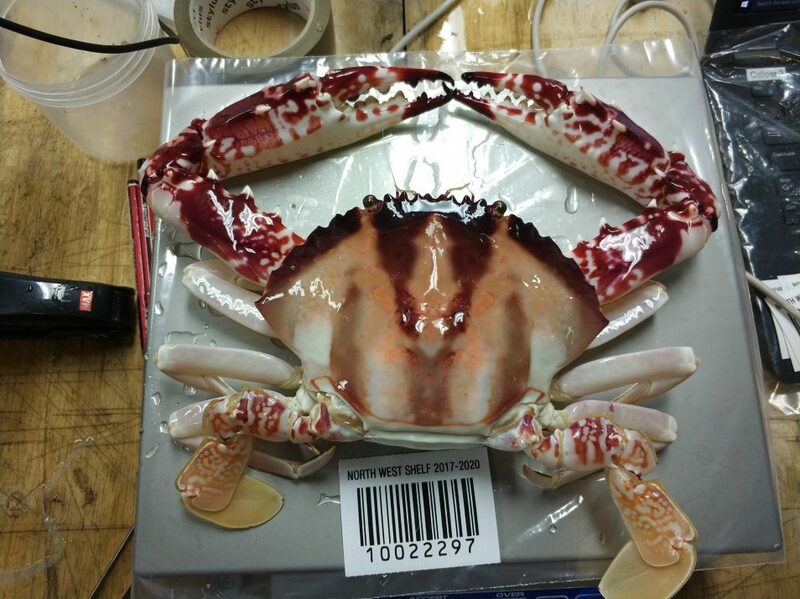 The review attempts to use what little information there is to paint a cohesive picture of how populations of deep sea creatures are connected over depth and distance. Often animals are disconnected over a few hundred metres of depth but relatively well connected over a few 1000 km distance. The effects of human activity, such as pollution, destructive trawl-fishing, deep sea mining and climate change, appear to be intensifying, and increasingly affecting populations of seafloor invertebrates. 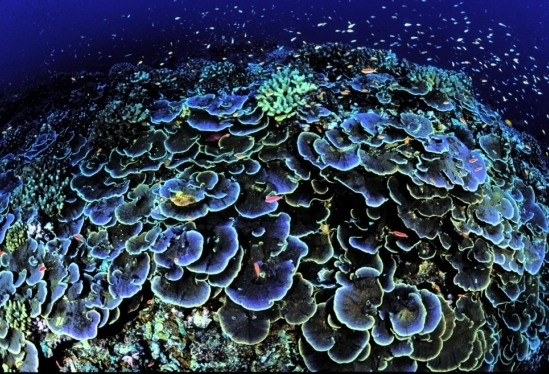 The impacts on fragile, slow-growing coral gardens are of particular concern. As ecosystem engineers, corals are biodiversity hotspots, potentially as vital to the seabed as the rainforests are to the Earth. The researchers acknowledge that getting data from the deep sea is costly and logistically challenging. However, they stress that recent technological developments mean that more genetic information about populations can be collected than ever before. Michelle Taylor, co-author and senior postdoctoral researcher in Oxford’s Department of Zoology, said: ‘Next-generation sequencing allows us to scan larger and larger portions of an animal’s genome and at a lower cost. This makes deep sea population genetic studies less costly, and for many animals, the sheer volume of data these new technologies create means they can now be studied for the first time. Scientists have improved our ability to interpret one of the most common measures of the temperature of Earth’s oceans in the distant past. The measurement is based on the ancient remains of tiny marine organisms called foraminifera, a type of plankton that lives and feeds in water. The organisms use calcium and magnesium from seawater to help form their shells – more magnesium when ocean temperatures are warmer and less when the temperatures are cooler. But magnesium levels can vary significantly within individual shells, and scientists have been exploring why. In a paper published recently in Nature Communications, scientists explain that changes in light levels from daytime to nighttime can cause the organisms to vary how they build their shells, which plays a direct role in determining the levels of magnesium in the shells. The information gives scientists a better understanding of the biological processes involved when using this plankton-based temperature gauge to assess past ocean conditions. The project was led by Jennifer Fehrenbacher of Oregon State University and also included scientists from UC Davis, the University of Washington, and EMSL, the Environmental Molecular Sciences Laboratory, a Department of Energy Office of Science User Facility at the Pacific Northwest National Laboratory. The team included John B. Cliff III and Zihua Zhu from EMSL and PNNL. The trace element composition of the calcite shells of foraminifera, sand grain-sized marine protists, is commonly used to reconstruct the history of ocean conditions in Earth’s past. A recent study explored environmental and biological factors that control the compositional variability of the element magnesium (Mg), which is used to reconstruct past ocean temperature. These findings suggest the same light-triggered mechanism is responsible for Mg banding in two species that occupy different ecological niches in the ocean, and that Mg variability is an integral component of shell-building processes in planktic foraminifera. The experimental results will be used to update a 70-year-old model of foraminifera shell development and could be used to develop more accurate methods for assessing past ocean conditions. The relationship between seawater temperature and the average Mg/Calcium (Ca) ratios in planktic foraminifera is well established, providing an essential tool for reconstructing past ocean temperatures. However, the mechanism responsible for variability in the trace element composition within individual shells is poorly understood. In particular, many species display alternating high and low Mg bands within their shell walls that cannot be explained by temperature alone. Recent experiments demonstrate intrashell Mg variability in Orbulina universa, which forms a spherical terminal shell, is paced by the daily light and dark cycle. Whether Mg heterogeneity is also controlled by the light and dark cycle in species with more complex shell structures was previously unknown. To address this knowledge gap, a team of researchers from Oregon State University; University of California, Davis; University of Washington; and EMSL, the Environmental Molecular Sciences Laboratory, a DOE Office of Science User Facility, combined culture techniques and high-resolution NanoSIMS imaging to show high Mg/Ca-calcite forms at night (in dark conditions) in cultured specimens of the multi-chambered species Neogloboquadrina dutertrei. The results also demonstrate N. dutertrei adds a significant amount of calcite, as well as nearly all Mg bands, after the final chamber forms. These results have implications for interpreting patterns of calcification in N. dutertrei, and suggest daily Mg banding is an intrinsic component of biomineralization in planktic foraminifera, likely modified by growth conditions. Moreover, the findings suggest the overall Mg content of the shell is primarily controlled by temperature, while the amplitude of the intrashell banding, which is triggered by a light response, is modulated by pH. By shedding light on mechanisms that control Mg variability in the shells of diverse planktic foraminifera, the findings could lead to improved methods for reconstructing past ocean conditions. This work was supported by the U.S. Department of Energy’s Office of Science (Office of Biological and Environmental Research), including support of the Environmental Molecular Sciences Laboratory (EMSL), a DOE Office of Science User Facility; and the U.S. National Science Foundation. Tony Wang (left) and Jess Adkins (right) with samples of Desmophyllum dianthus fossils. Using a library of more than 10,000 deep-sea corals collected by Caltech’s Jess Adkins, an international team of scientists has shown that periods of colder climates are associated with higher phytoplankton efficiency and a reduction in nutrients in the surface of the Southern Ocean (the ocean surrounding the Antarctic), which is related to an increase in carbon sequestration in the deep ocean. A paper about their research appears the week of March 13 in the online edition of the Proceedings of the National Academy of Sciences. “It is critical to understand why atmospheric CO2 concentration was lower during the ice ages. This will help us understand how the ocean will respond to ongoing anthropogenic CO2 emissions,” says Xingchen (Tony) Wang, lead author of the study. Wang was a graduate student at Princeton while conducting the research in the lab of Daniel Sigman, Dusenbury Professor of Geological and Geophysical Sciences. He is now a Simons Foundation Postdoctoral Fellow on the Origins of Life at Caltech. 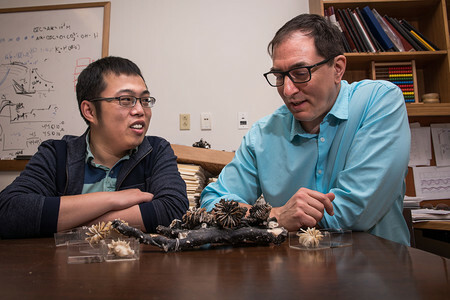 “Finding a few centimeter-tall fossil corals 2,000 meters deep in the ocean is no trivial task,” says Adkins, Smits Family Professor of Geochemistry and Global Environmental Science at Caltech. Scientists will expand research on ocean food webs in ecosystems that include recreational and commercial fisheries. 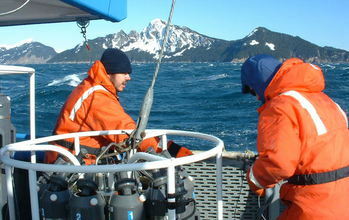 Scientists at the Northern Gulf of Alaska LTER site conduct research off the coast of Alaska. National Science Foundation (NSF) grants will support two new Long-Term Ecological Research (LTER) sites. Scientists will conduct research along the Northeast U.S. continental shelf and in the northern Gulf of Alaska, regions known for productive fisheries and abundant marine resources. The new LTER sites were each awarded $5.6 million over five years, adding to 25 existing LTER sites in ecosystems including the open ocean, coral reefs, deserts and grasslands. The complex food webs in these regions are affected by human activities, short-term environmental variability and long-term ecosystem changes. Researchers at the Woods Hole Oceanographic Institution (WHOI), along with scientists at the University of Massachusetts, Wellesley College and the University of Rhode Island, will lead the Northeast U.S. Shelf LTER site. Scientists at the University of Alaska Fairbanks, in collaboration with researchers at Western Washington University, Oregon State University and the University of California, Santa Cruz, will manage the Northern Gulf of Alaska LTER site. Scientists have documented environmental changes in the Atlantic Ocean off the U.S. Northeast coast, but they’ve lacked an understanding of the links among the ocean environment, plankton food webs and fish stocks. That has limited their ability to predict how this ecosystem will respond to environmental change. Research at the new LTER site will fill that gap. The NSF Northeast U.S. Shelf LTER site spans the continental shelf across an area connecting the WHOI-operated Martha’s Vineyard Coastal Observatory with the Pioneer Array, part of NSF’s Ocean Observatories Initiative. The Pioneer Array, a group of moorings and other instruments, is located off the coast of southern New England where coastal waters meet the open ocean. These instruments collect continuous data and, along with samples retrieved by scientists aboard ships, will become integral parts of ecological models of the changing Atlantic ecosystem. Two decades of research along Alaska’s Seward Line — a series of ocean sampling stations extending from Resurrection Bay near Seward, Alaska to the continental slope 150 miles offshore — are the foundation of the new NSF Northern Gulf of Alaska LTER site. The new LTER site will allow researchers to make observations across a larger geographic region. 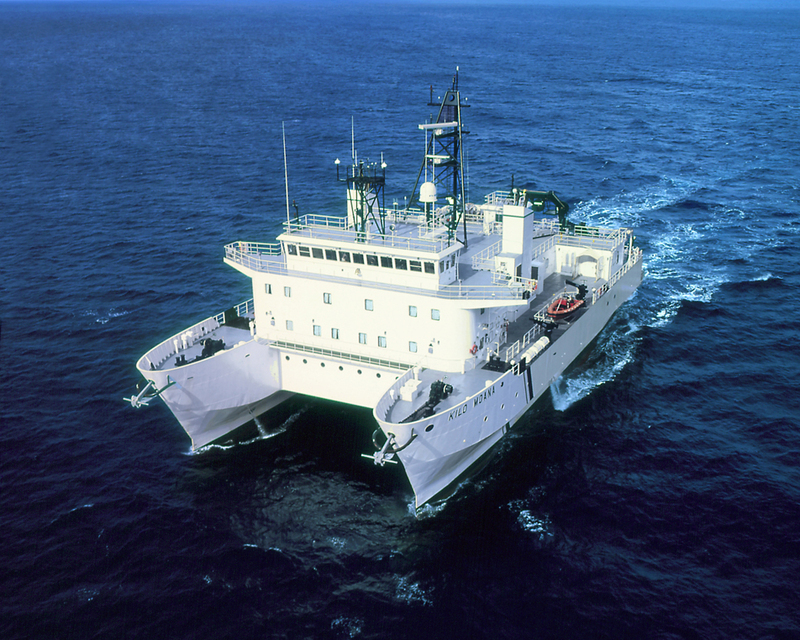 It will also give scientists an opportunity to undertake studies aboard the NSF research vessel Sikuliaq, operated by the University of Alaska Fairbanks. Researchers at the Northern Gulf of Alaska LTER site will study the gulf’s waters, which support the well-known fish, crabs, seabirds and marine mammals of Alaska. The scientists say that the addition of the Northern Gulf of Alaska site to the LTER network will lead to a better understanding of an ecosystem with many of the nation’s largest fisheries. As Earth warms, much of the extra heat is stored in the planet’s ocean — but monitoring the magnitude of that heat content is a difficult task. A surprising feature of the tides could help, however. Scientists at NASA’s Goddard Space Flight Center in Greenbelt, Maryland, are developing a new way to use satellite observations of magnetic fields to measure heat stored in the ocean. A surprising feature of the tides could help, however. 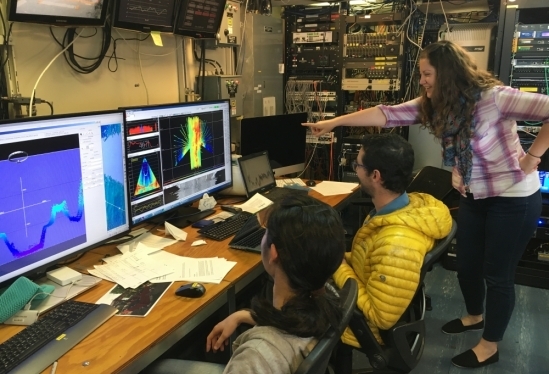 Scientists at aNASA’s Goddard Space Flight Center in Greenbelt, Maryland, are developing a new way to use satellite observations of magnetic fields to measure heat stored in the ocean. Despite the significance of ocean heat to Earth’s climate, it remains a variable that has substantial uncertainty when scientists measure it globally. Current measurements are made mainly by Argo floats, but these do not provide complete coverage in time or space. If it is successful, this new method could be the first to provide global ocean heat measurements, integrated over all depths, using satellite observations. Tyler’s method depends on several geophysical features of the ocean. Seawater is a good electrical conductor, so as saltwater sloshes around the ocean basins it causes slight fluctuations in Earth’s magnetic field lines. The ocean flow attempts to drag the field lines around, Tyler said. The resulting magnetic fluctuations are relatively small, but have been detected from an increasing number of events including swells, eddies, tsunamis and tides. Researchers know where and when the tides are moving ocean water, and with the high-resolution data from the Swarm satellites, they can pick out the magnetic fluctuations due to these regular ocean movements. That’s where another geophysical feature comes in. The magnetic fluctuations of the tides depend on the electrical conductivity of the water — and the electrical conductivity of the water depends on its temperature. At the American Geophysical Union meeting in San Francisco this week, Tyler and collaborator Terence Sabaka, also at Goddard, presented the first results. They provide a key proof-of-concept of the method by demonstrating that global ocean heat content can be recovered from “noise-free” ocean tidal magnetic signals generated by a computer model. When they try to do this with the “noisy” observed signals, it doesn’t yet provide the accuracy needed to monitor changes in the heat content. But, Tyler said, there is much room for improvement in how the data are processed and modeled, and the Swarm satellites continue to collect magnetic data. This is a first attempt at using satellite magnetic data to monitor ocean heat, he said, and there is still much more to be done before the technique could successfully resolve this key variable. For example, by identifying fluctuations caused by other ocean movements, like eddies or other tidal components, scientists can extract even more information and get more refined measurements of ocean heat content and how it’s changing. More than 90 percent of the excess heat in the Earth system goes into the ocean, said Tim Boyer, a scientist with the National Oceanic and Atmospheric Administration’s National Centers for Environmental Information. 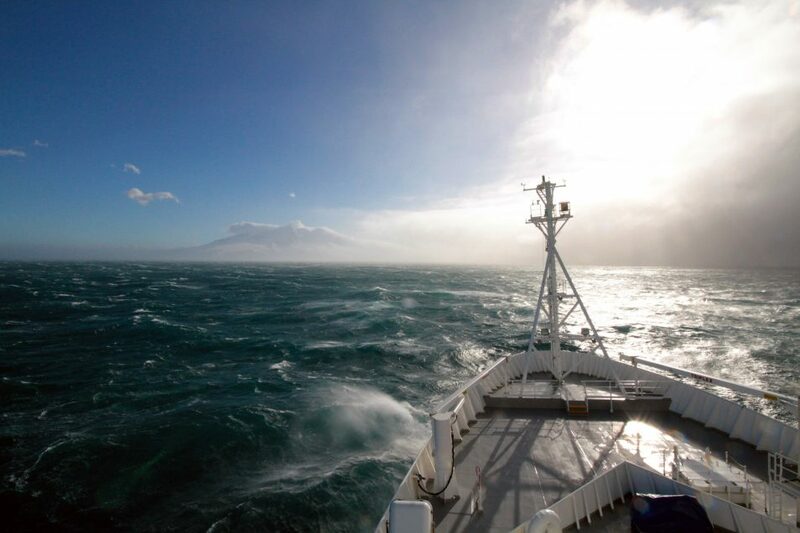 Scientists currently monitor ocean heat with shipboard measurements and Argo floats. While these measurements and others have seen a steady increase in heat since 1955, researchers still need more complete information, he said. Changing ocean temperatures have impacts that stretch across the globe. In Antarctica, floating sections of the ice sheet are retreating in ways that can’t be explained only by changes in atmospheric temperatures, said Catherine Walker, an ice scientist at NASA’s Jet Propulsion Laboratory in Pasadena, California. She and her colleagues studied glaciers in Antarctica that lose an average of 6.5 to 13 feet (2 to 4 meters) of elevation per year. They looked at different options to explain the variability in melting — surrounding sea ice, winds, salinity, air temperatures — and what correlated most was influxes of warmer ocean water. “These big influxes of warm water come onto the continental shelf in some years and affect the rate at which ice melts,” Walker said. She and her colleagues are presenting the research at the AGU meeting. Walker’s team has identified an area on the Antarctic Peninsula where warmer waters may have infiltrated inland, under the ice shelf — which could have impacts on sea level rise. Float and ship measurements around Antarctica are scarce, but deep water temperature measurements can be achieved using tagged seals. That has its drawbacks, however: “It’s random, and we can’t control where they go,” Walker said. Satellite measurements of ocean heat content and temperatures would be very useful for the Southern Ocean, she added. Ocean temperatures also impact life in the ocean — from microscopic phytoplankton on up the food chain. Different phytoplankton thrive at different temperatures and need different nutrients. “Increased stratification in the ocean due to increased heating is going to lead to winners and losers within the phytoplankton communities,” said Stephanie Schollaert Uz, a scientist at Goddard. n research presented this week at AGU, she took a look 50 years back. Using temperature, sea level and other physical properties of the ocean, she generated a history of phytoplankton extent in the tropical Pacific Ocean, between 1958 and 2008. Looking over those five decades, she found that phytoplankton extent varied between years and decades. Most notably, during El Niño years, water currents and temperatures prevented phytoplankton communities from reaching as far west in the Pacific as they typically do. Digging further into the data, she found that where the El Niño was centered has an impact on phytoplankton. When the warmer waters of El Niño are centered over the Eastern Pacific, it suppresses nutrients across the basin, and therefore depresses phytoplankton growth more so than a central Pacific El Niño. “For the first time, we have a basin-wide view of the impact on biology of interannual and decadal forcing by many El Niño events over 50 years,” Uz said. As ocean temperatures impact processes across the Earth system, from climate to biodiversity, Tyler will continue to improve this novel magnetic remote sensing technique, to improve our future understanding of the planet. With a $10 million gift from Marc and Lynne Benioff, UC Santa Barbara establishes the Benioff Ocean Initiative to study and solve ocean issues. The Benioff Ocean Initiative based at and led by UC Santa Barbara aims to research the root causes of pervasive ocean issues and use science to solve them. Marc and Lynne Benioff have gifted UC Santa Barbara with more than $10 million to establish the Benioff Ocean Initiative, which will be directed by Douglas McCauley. Maybe it’s all the plastic you see on the beach where you take your kids. Or that news story you read about shark-finning and can’t quite get it out of your mind. Are you frustrated trying to identify sustainable options on the menu at your favorite seafood restaurant? These are common concerns, and they all lead back to one place: the ocean. And with climate change acidifying and heating up the seas, global fisheries being overharvested and more than 5 trillion pieces of plastic working their way into marine food webs, they’re the tip of a massive threat to our oceans. The Benioff Ocean Initiative, a bold new endeavor led by the University of California Santa Barbara, aims to research the root causes of these pervasive ocean problems and use science to solve them, supported by funding from Marc and Lynne Benioff. Marc Benioff is the co-founder, chairman and chief executive officer of Salesforce, one of the world’s leading software companies, and a leader in changing global attitudes about the social responsibility of businesses. Lynne Benioff is on the board of directors of Hampton Creek, the board of overseers of the University of California San Francisco Foundation, the board of directors of UCSF Benioff Children’s Hospital Oakland and the board of directors of Common Sense Media. In 2015, Lynne Benioff was appointed to the board of directors of the Presidio Trust by President Obama. Known for their extensive philanthropic support of children’s health and education, the couple has gifted UCSB more than $10 million to establish the Benioff Ocean Initiative. Cast as an experimental new model for university-driven change, the innovative effort will bring senior ocean scientists together with students to develop science-based solutions that will address problems plaguing the oceans. In an effort to link together the strength of university-powered research with the creativity of global ocean communities, this new initiative will use a crowdsourcing campaign to collect ideas on ocean issues submitted from anyone, anywhere in the world. These ideas will set the agenda for the initiative. “On behalf of UC Santa Barbara, I wish to express our deep appreciation for the truly inspiring and generous commitment by Marc and Lynne Benioff,” said Chancellor Henry T. Yang. “With this transformative gift, we are proud to establish the Benioff Ocean Initiative, which will enhance the ability of researchers and community stakeholders to address current problems in ocean health through applied environmental science. 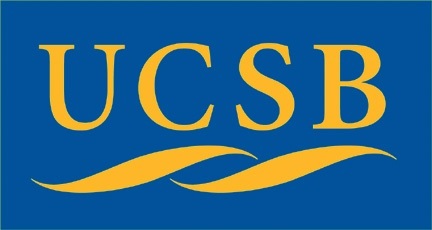 Headquartered at UCSB’s Marine Science Institute, an internationally recognized center of excellence for interdisciplinary oceans research, the Benioff Ocean Initiative is being directed by noted marine biologist Douglas McCauley, but will be run as a collaboration among ocean scientists worldwide, as well as students. Together they’ll highlight the most pressing threats to ocean health through research, and then use what they learn to address these illnesses in the ocean. The initiative will assemble and fund a team of global experts to intensely research a solution to selected problems. During a subsequent research summit at UCSB, scientists on the team will share what they’ve learned and collaboratively design a best fix for the problem. Then the best part: bringing that fix to life. In a world where the oceans provide millions of jobs and yield trillions of dollars in goods and services each year, and where 1.4 billion people frequently rely on fish as a food source, that replication will be key, according to McCauley. Thanks to just such an investment by Marc and Lynne Benioff, that’s precisely what the ambitious Benioff Ocean Initiative intends to do. “I am honored and delighted that Marc and Lynne Benioff have decided to establish the Benioff Ocean Initiative here at UC Santa Barbara,” said Pierre Wiltzius, the Susan & Bruce Worster Dean of Science and executive dean of the College of Letters and Science at UCSB. “Their passion for creating a better world through meaningful, deliberate change is inspirational, and their desire to bring students together with top researchers is directly aligned with the goals of this university.